If you don't see the email in your inbox, check your spam/junk folders, because it may have been delivered there. If so, we recommend adding noreply@workjam.com to your address book to prevent this in the future. Click the CLICK HERE TO REGISTER button in the email to continue. This will take you to the registration form, which may be pre-populated with information entered by your company. If the link doesn’t work, just enter https://app.workjam.com/register into your web browser. Once you adjust the pre-populated information, and/or fill in missing information, just create your password. Once you've adjusted the pre-populated information, and filled in any missing information, you must create a password that combines 8 or more letter(s) and number(s). Your password will be case-sensitive. Click SUBMIT and that's it! You're all set to start using your WorkJam account. We recommend that you register from work, when your manager is around, so they can guide you through the process. Once directed to this registration page, you must fill in the required information, along with your unique 8-character access code. If you don't have an email address, just select the Don't have an email address checkbox located under the Email field. Checking this box will reveal a field that makes it possible for you to create a username instead. Your username is what you'll use to sign into your WorkJam account. Make it something memorable, like your first initial and last name (e.g., EGonzales, if your name is Eddie Gonzales). NOTE: Your username cannot contain spaces. Once you've selected a username, create a password that combines 8 or more letter(s) and number(s). Your password will be case-sensitive. Now, enter the unique 8 character access code, provided to you by your company. If you don’t know what your access code is, just ask your manager. Press SUBMIT and that's it! 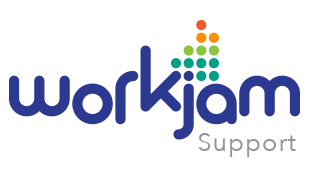 You're all set to start using your WorkJam account.